We have two indicators of a good meal, here in the Southern In-Law house. If something is really good - it's usually referred to as "Blog worthy" or "Almost as good as the Chicken and Bacon Rice Bowl" (Jesse's hands down, ultimate favourite dinner ever). The Stir Fry is sitting pretty as a tied second favourite meal for Jesse at the moment - tied only with the Brown Rice Quiche that everyone loves and followed by the Cheesy Quinoa Bakes. You may remember that I couldn't tolerate soy before, and that's right! Previously, soy of any kind left me with an incredibly sore stomach and feeling horrible - but not anymore! My friends at Spiral Foods sent me some of their delicious products to try out - and in that box was some of their Gluten Free Tamari Sauce (Gluten Free Soy Sauce!) and I knew I wanted to test my stomach and see if I could once again enjoy my favourite stir fry - and I can!! The tamari tastes exactly like Soy Sauce (unlike one tamari I tried a long time ago which was awful) and it's perfect for this stir fry! We plan on keeping Tamari in our cupboards from now on as everyone can enjoy it! Best of all, it's super adaptable! We make it with beef, chicken (or both as above) and throw in whatever veggies we have in the fridge at the time. You can serve it on whatever noodles you like - or serve it on top of quinoa, rice or whatever you fancy! Cook your noodles and meats/protein if using. Slice up your vegetables and set aside, ready to add. In a wok or saucepan over a medium heat, pour in your soy sauce and tahini and stir until it combines. Add in your vegetables and stir through the sauce before covering, allowing the vegetables to steam. If needed, add in a tablespoon or so of water so that your sauce does not burn. Once your vegetables are tender, add in your noodles and protein (if using). Mix everything together and allow to heat through before taking off the heat and serving immediately. *You can use hulled or unhulled tahini. 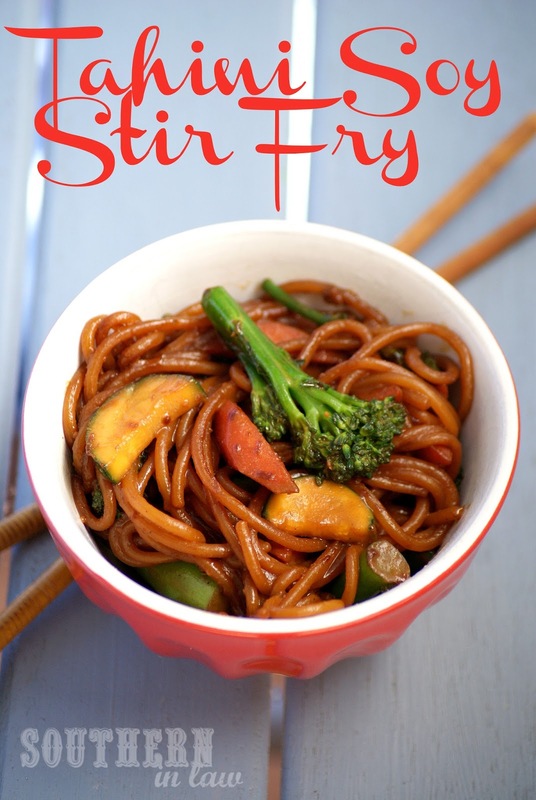 I have both and tend to use unhulled tahini in this stir fry, just as I used the hulled tahini for other dishes (as it's more versatile) and the unhulled tahini isn't used as much. **For the noodles, I use Chang's Egg Noodles for Jesse and Rice Stick Noodles for me which I bought from an Asian Grocer, but you can use whatever you prefer! (I also use Brown Rice Spaghetti when I don't have any noodles around). ***Vegetable Suggestions: Carrot, Zucchini, Broccoli, Broccolini, Corn, Peas, Beans, Snowpeas, Silverbeet, Spinach, Bok Choy - whatever you feel like! Protein Suggestions: Try sliced chicken, beef, lamb or tofu - or whatever you usually use in a stir fry. So tell me, do you have a yum-ness scale in your house? and What do you like in your stir fry? Kristy received Spiral Food products with compliments of Spiral Foods. There was no obligation to post or share these products and all opinions expressed are Kristy's own. This looks delicious!! 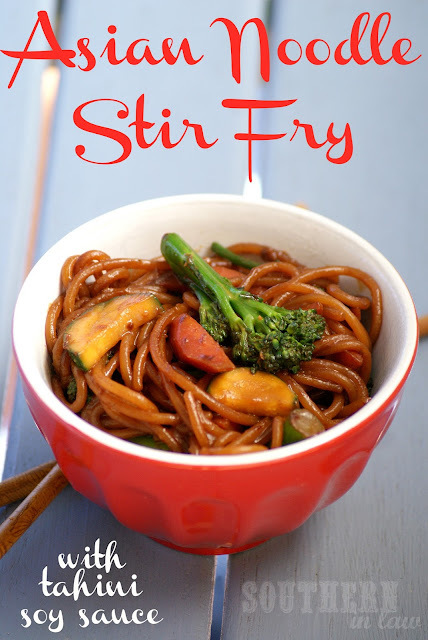 I absolutely LOVE stir fry and this just looks perfect!!! Plus, it is chilly and rainy here today, making it a perfect day for this recipe!! I didn't realize that regular soy sauce contains gluten! That's really good to know; it's not something I've ever seen before when researching a GF diet. Thanks for the tip! Haha, one day, one day! Most soy sauces (unless otherwise stated) are made with wheat flour so they're definitely not gluten free friendly! It's something that alot of people don't know and I've noticed that some asian restaurants will tell you they have gluten free options - but they're not actually gluten free as they use regular soy sauce. It's so yum! Definitely give it a try - and if you don't have tahini, I've also used sunflower butter and it was delicious, though I've yet to try it with peanut butter! Wow! Your recipe is very lovely! I think the ingredients on your dish is very cheap yet nutritious! I want to try this one tomorrow morning.